Create awesome and innovative projects to solve real life problems and win prizes! 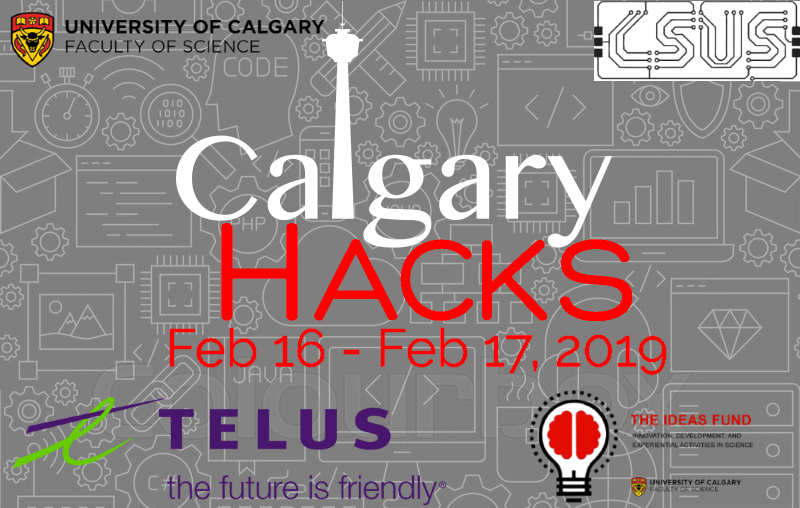 CalgaryHacks is a sprint-like, competitive programming contest designed to promote creativity, collaboration, and innovative thinking. Last year's event saw nearly 200 participants. Students primarily from the Calgary region will be working with the latest platforms, hardware, and software over the course of 24 hours to build some of the most innovative, and technical projects. Teams of up to five (5) are allowed. CalgaryHacks is an excellent way for participants to hone and showcase their problem-solving skills and to connect with working professionals that will be attending CalgaryHacks as representatives and judges. The event presents a great opportunity for participants to develop new skills and also act as a bridge to close the gap between their academics and career! Sign-in will start at 9 AM and end at 1 PM right outside ICT 102. Free food, snacks, and drinks will be provided during the hackathon, so please let us know if you have any dietary restrictions or allergies. This year's topic is "Best Artificial Intelligence/IoT* Sustainable Cities (Smart Cities)"
A list of problem statements related to the topic will be given at 11 AM on Saturday. Contestants will then pick one of the problems to solve using any technologies (software and/or hardware) at their disposal. Please submit a zipped file containing all your source code. Does the proposal address the problem statement and theme? Is the idea innovative? How technically creative was the group in solving the challenge? Was the group's approach technically challenging? How well-designed and polished was the group's demo? Did the group think about the user interface (UI)? Did the group think about the user experience (UX)? Does the presentation clearly define and address the problem statement as well as the group's proposal?